I never get out of my PJs on Sunday, and don't do much more than read, nap and watch TV. It is a lovely lazy day. With weather expected for late Monday, and worse on Tuesday, we get out Monday morning while we can. Camping World in Bellemont is just up the road - we go to pick up a new water pressure regulator, and check their availability for an oil change. A nice size facility, and we're able to get a very convenient appointment for our travel day. Coming out of the store the wind is up again, with clouds threatening to the northwest. 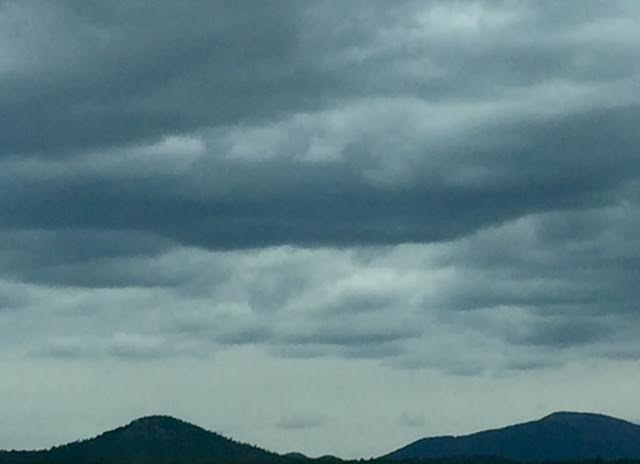 Although the skies are somewhat intimidating, there is no precipitation on the radar so we take A-1 Mountain Road (the best I'm sure) off the freeway in search of more forest roads. We pass several large homes in a new-looking gated community, and then the pavement ends. Yay - more back roads to explore! 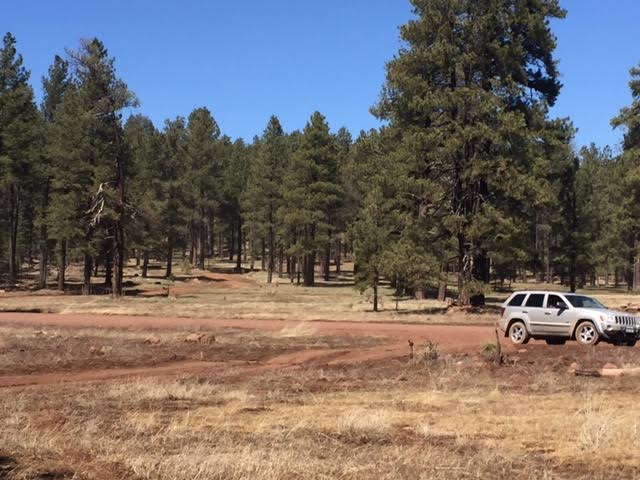 There are numerous boondocking locations here - we're again in the Coconino National Forest. 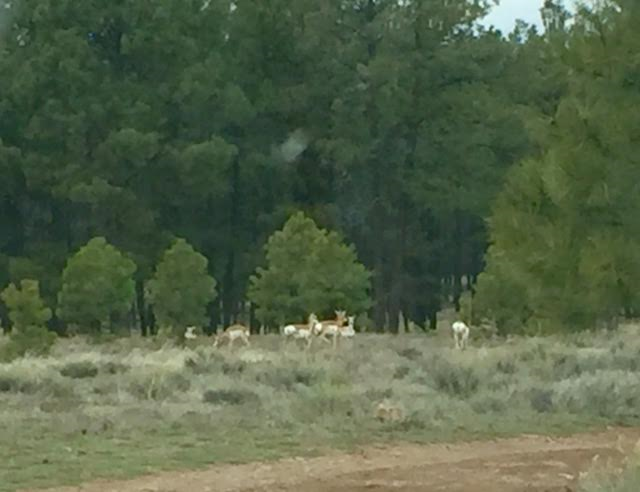 Investigating one of the spots, we come upon a small herd of prong horns. They don't stick around for many photos. Not quite as well camouflaged as the mule deer, they still blend in with the gold grass. The roads get rougher as we move deeper into the forest, and closer to Mt Humphreys. There is no sign of any other people here, and we keep our eyes open for more wildlife. Bill sees a small lake on Imaps, and we do find it. But it's a dirt tank for animals - dry today and really, really small. We're amazed it shows up on the map! That stuff's cold - I'm outta here! It is beautiful back here. Both old growth and new saplings, this forest is healthy. Standing under these beauties, we hear the wind rushing through the tree tops, dropping lower, then kicking up a bit of dust as it touches down for just a second before moving on. A few minutes later, we hear more coming from the distance. Powerful, mesmerizing, but too cold to enjoy for long. The campsites show some signs of recent use, but are clean with little impact. We appreciate this. In one area is a large number of downed timber. They are all small trees, and it looks more like a huge wind knocked them down several years ago, than anything humans have done. We find more patches of snow, including a small area we have to drive over. What we don't find is access to the road that would make this a loop, so we return the way we came. Sadly we don't see any other wildlife, and the prong horns have moved on. There are several birds, but they are all moving so fast we can't really see what they look like. Back home, the wind increases and we hunker down for the evening. The rain comes during the night, heavy at times. And in the morning it is snowing! 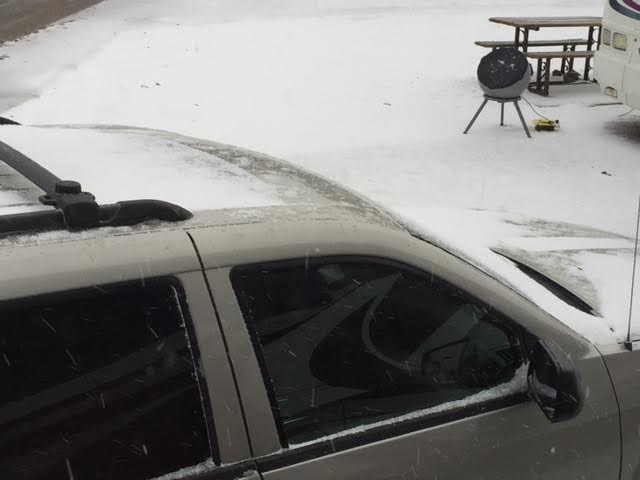 It's sticking and within an hour we have a pretty good coating all around us. By 10 AM it's melting and there is intermittent sunshine. The wind is still up, moving the clouds quickly past the tall, waving pines around us. Doesn't feel much like Spring. Our "schedule" included 2-3 weeks in this area, even before the windshield issue. 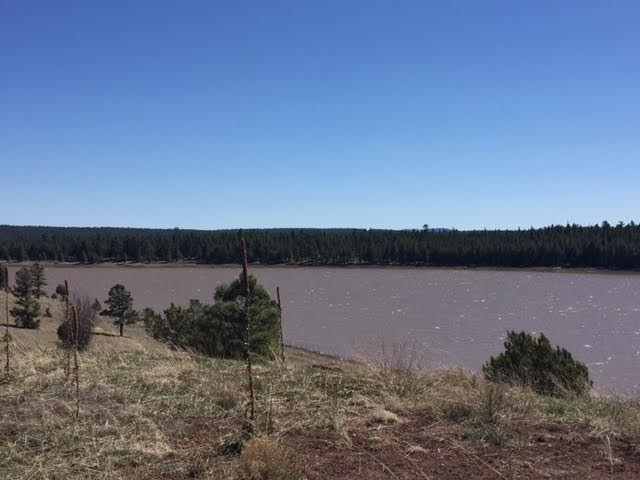 From the Grand Canyon to Sedona, and everything in between, there are so many beautiful and interesting places to see from Flagstaff, AZ. Might as well jump in! 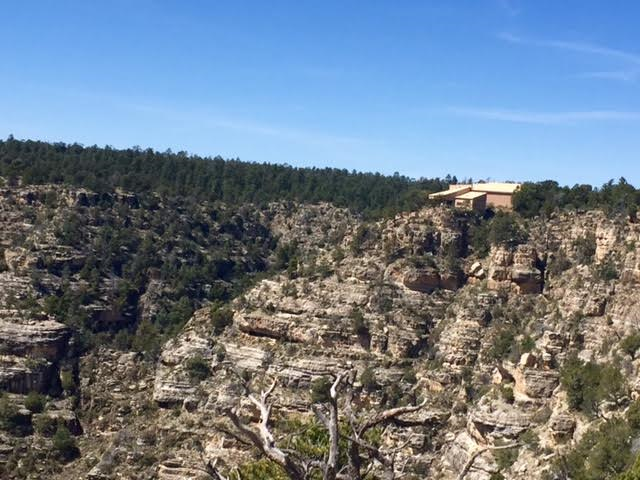 Ten miles from downtown Flagstaff is Walnut Canyon National Monument. 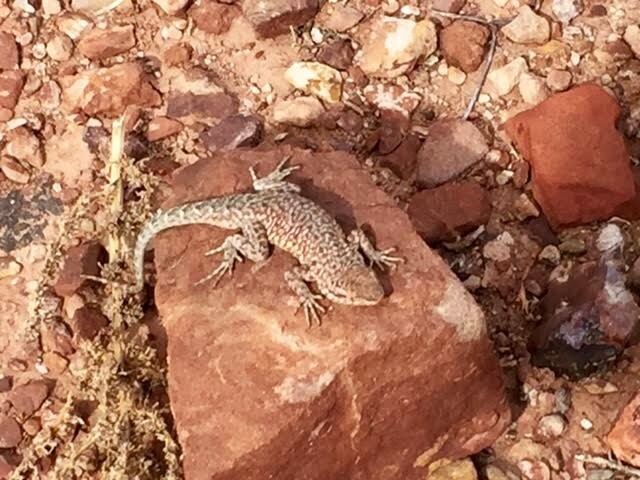 Initially established in 1915 to preserve ancient cliff dwellings, this biological "hot spot" has become a significant natural resource. Most of the 3600 acres are steep, inaccessible canyon walls. With the varied exposures and elevations compressed into a narrow band surrounded by tall pines, this eco-sytem combines hot desert-like slopes and shaded forests. These areas are normally separated by thousands of feet of elevation, but here are found nearly side-by-side. It is hard to imagine people making permanent homes here for 100's of years. Although it was a harsh environment here in 1400 AD, the more recent addition of the dam and de-forestation has made it the un-inhabitable place of today. The Island Trail is a one-mile round trip. 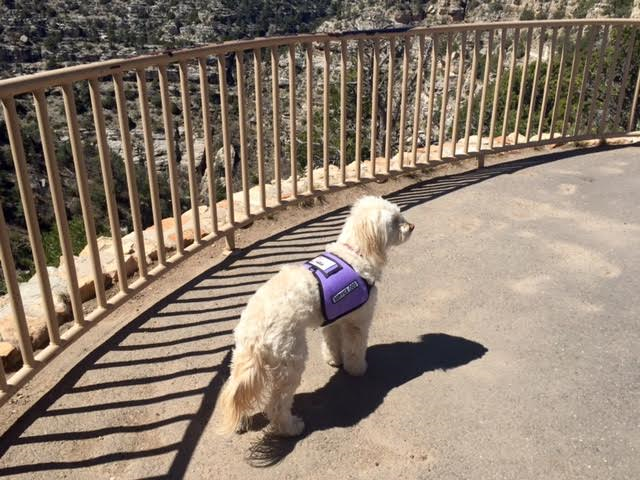 At 7,000 feet and 185 foot vertical drop at the beginning, and climb at the end, it isn't for us. All the parking places at the visitors center are full, there are a lot of people here. And they're all on the Island Trail. Which makes the flatter 3/4 mile Rim Trail perfect for the three of us. 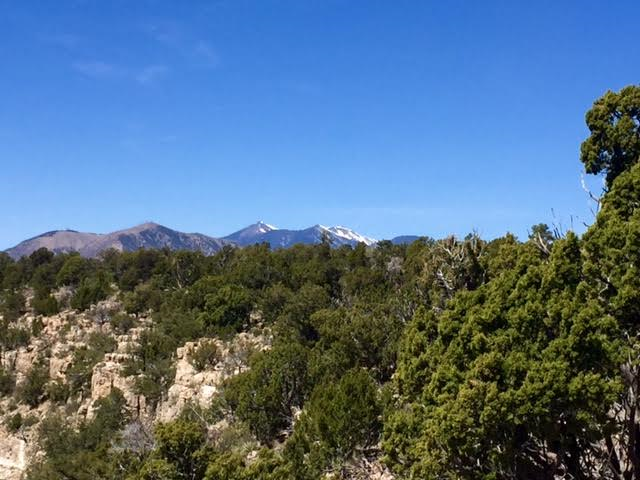 The sky is azure and the only sound is the wind in the junipers and pines, and a few birds singing around us. Near the ruins at the end of the trail, we see movement in the distance and four mule deer bound through the trees. When they stop they are impossible to see without knowing exactly where they are. They completely blend into their surroundings. No pics. Looking for "the dog". Don't ask. When we get back, the windshield shop owner comes by to diagnose the issue as promised. He agrees the windshield needs to come out, he'll contact the insurance company. And we'll wait to hear what's next. It is wonderful being back in the mountains so we decide to go play in the forest on Friday. Flagstaff is a nice city, but the traffic is crazy! Not Seattle-crazy, but definitely a lot busier than Santa Fe. Being out of town on the weekend also seems prudent. 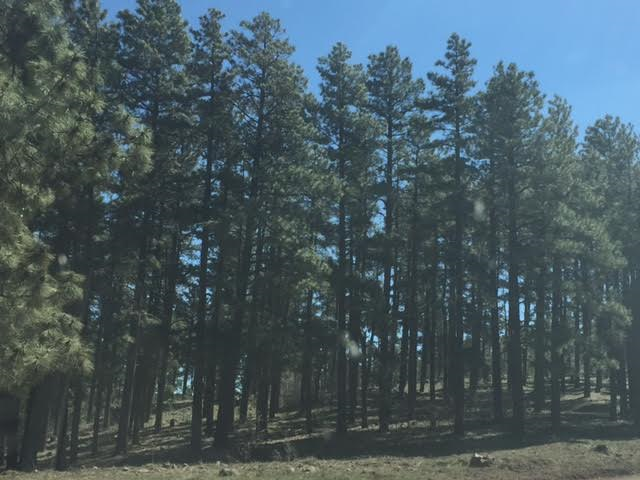 The Coconino Forest is huge. We head south on Hwy 17 as far as Stoneman Lake Road and turn east. 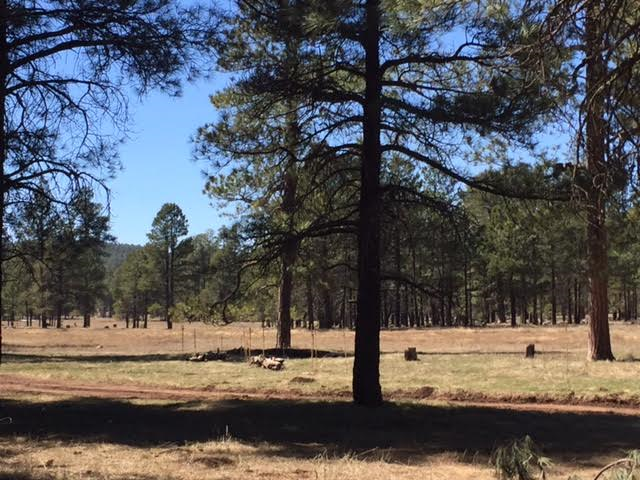 This area is junipers and pinons and new grass. The road makes a steady climb, and at eight miles the pavement ends. We soon figure out this is a popular hunting area. Several camps along the road, and trucks and ATVs on the road. The wind is up and there is a bit of dust in the air. Still, it's green and beautiful here. 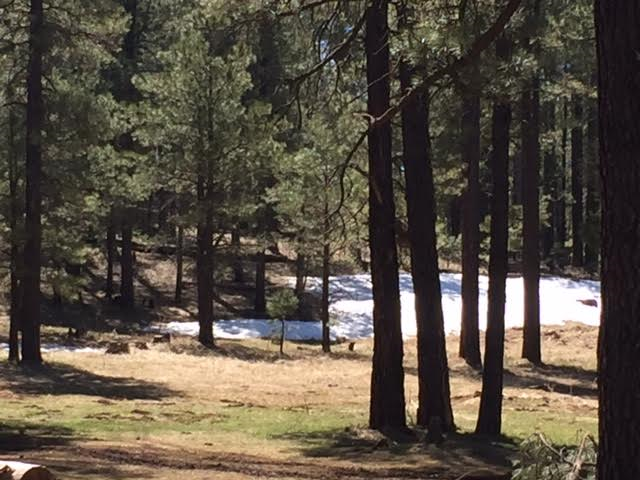 Small patches of snow remain on low banks. We get back on pavement about 3 miles from Morman Lake. Which isn't a lake today. We are sad that it is like the ones in Oregon and northern California, but learn later that the 600 acres is a "shallow and intermittent lake being 10 feet at it's deepest". It must be beautiful when full, surrounded by forest and meadow. Not far down the road we find Upper Mary Lake. There's water here, quite a bit. But it is all brown. Signs tell of bald eagle and osprey in the area, but a few ravens is all we see. Upper Mary Lake. The small white caps look like melting whip cream on hot chocolate. It is a beautiful day of playing in the forest - just what we were looking for. With the exception of the few hunters, we saw very few other people. Pretty sweet for a holiday weekend. 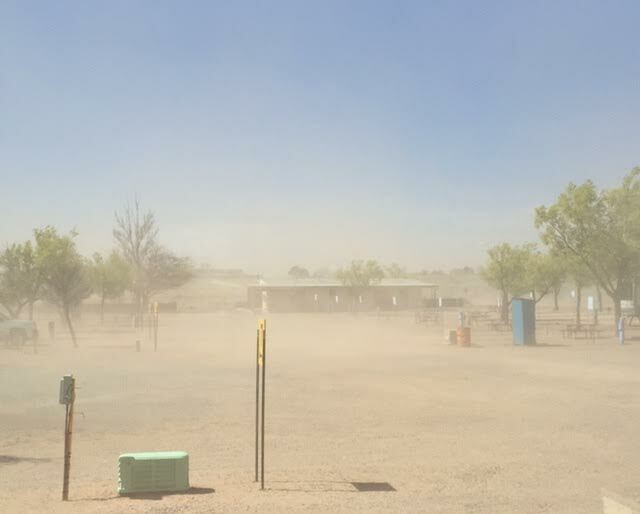 The tumbleweed attack in Albuquerque was a breezy day compared to Tuesday's dust bowl. 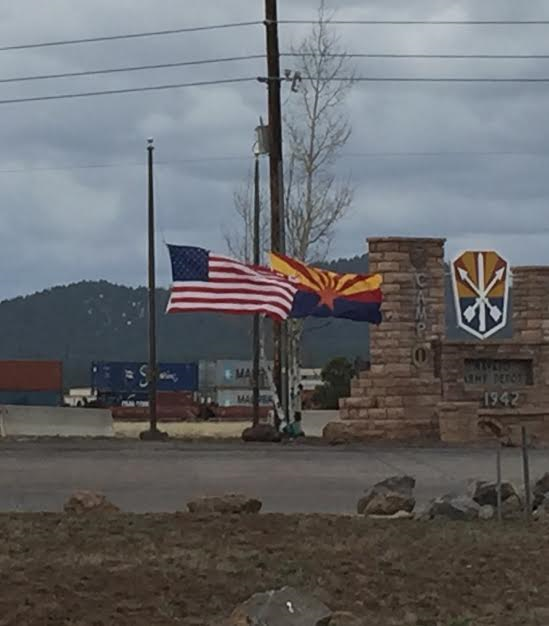 With sustained winds of 40 mph for six hours, and gusts up to 59 mph, it was a miserable day in Holbrook, AZ. The RV park is "down wind" from a large sand dune, plus the park grounds are mostly dirt with very little gravel and no pavement. Because of the spacing, even when other RVs pulled in to sites next to us, there was nothing blocking us from the onslaught. Satellite came down and two slides came in mid-day. 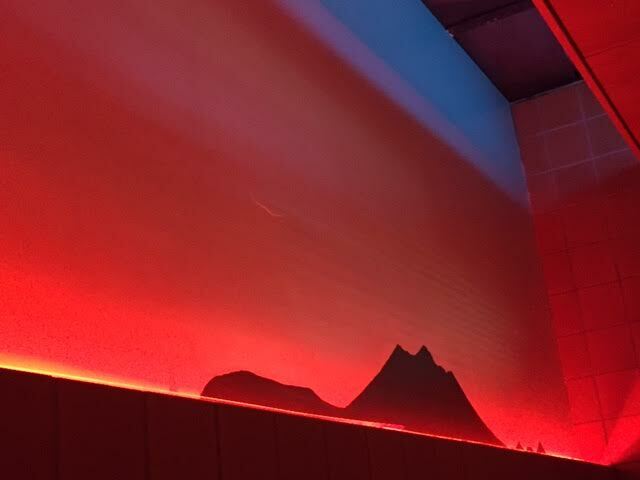 We ventured out for lunch at Romos, just to get away from the sound of sand pelting our paint and glass. The full-side slide eventually came in as the gusts continued to get worse. You never know if you're over-reacting to the flapping of the slide toppers, but we're glad we pulled them in as we watched the topper on the rig in front of us ripping away from the roof line. They put cinder blocks on top of the other toppers, and after it was already torn they did add another one. 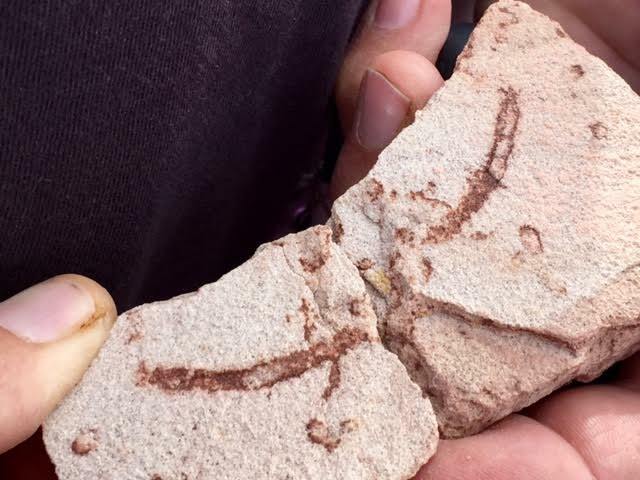 Maybe New Mexico didn't like the bad wind rap. In which case I offer my sincere apologies - no further "messages" necessary! With more wind expected on Friday, we decided to head out a day early. A short 90 miles takes us to Flagstaff where we have an appointment for the windshield to be diagnosed and repaired. 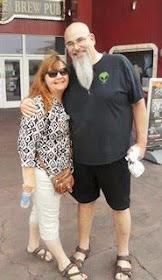 I knew from Google Street View that there was a large vacant lot across the street, and I pull in there so Bill can unhook the Jeep. We're hopeful that the rubber can be resealed while we check out the town. Unhooked, I move next to the shop. And that's as far as we get at this place. The tech looks at the problem, explains they don't have the equipment necessary to remove the windshield and that's what has to happen. They do refer us to a shop that does have the equipment, so we drive to the RV park. 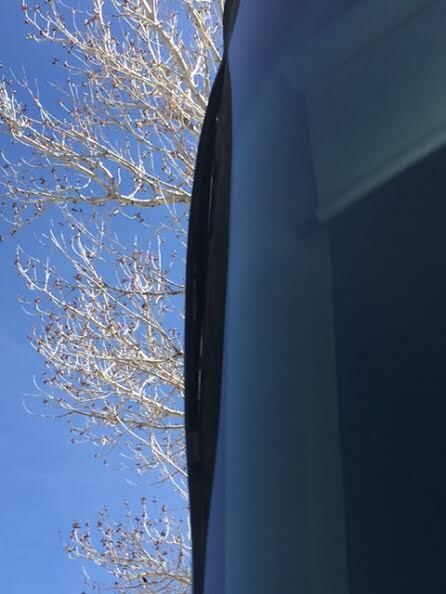 Since this is the continuation of an insurance claim I'm not happy that the company didn't send us to a shop that can handle RVs. And I spoke with the shop the day before to confirm our appointment and they knew we were an RV. What is it about this industry that makes it necessary to go through multiple places to find someone who can actually fix an RV???? 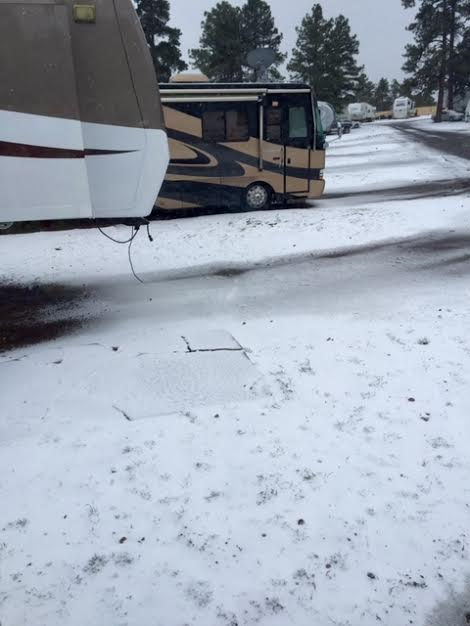 Black Barts RV Park is not a particularly nice park. There are tall pine trees, and the spaces are adequate. The water pressure is good, the site level enough, and we have 50 amp. But the park is again right on I-40 with railroad tracks nearby as well. The interior roads are very rough, and the permanent rigs are not well cared for. We'll look around for other parks, but until we figure out the windshield we're here. 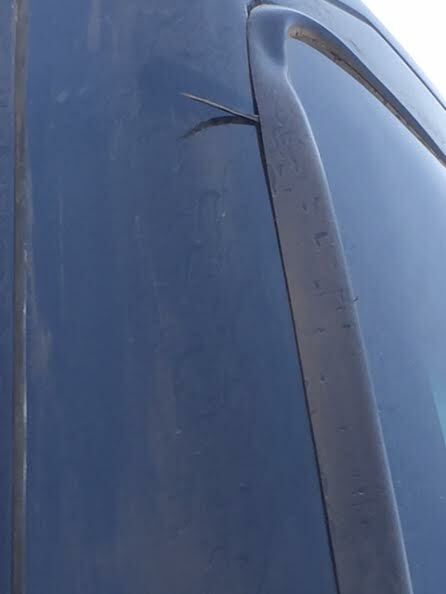 I contact the referred shop and the owner will come out to the park to diagnose the windshield. That saves us one take down and drive into town, so I'm happier. Email to the insurance rep about our latest issue, give her the shop's information, and put it all aside for now. Lots to see and do in this beautiful area, we're looking forward to making more wonderful discoveries. All the years I lived in Lodi, CA, I never thought about opening a "Stuck in Lodi" tourist destination. Certainly the 1969 Credence Clearwater Revival song was every bit as popular as the one memorialized in the little town of Winslow, AZ. Dang, probably too late now. Winslow has certainly capitalized on the Jackson Browne/Glenn Frey song, "Take It Easy", made famous by The Eagles, with the building of a small park - you guessed it - on the corner. As part of the revitalization of the downtown area started in 1997, the park was funded by donations and opened in September 1999. It includes a bronze statue of Browne, a mural of the flatbed Ford, and the old hotel front. Being Eagles' fans ourselves, and staying less than 30 miles up the road, we aren't going to miss it! What else would you park here? And there's only one dealership in Winslow - yep, Ford. Yes, I bought t-shirts (to help the local economy of course). The clerk says she sees up to 100 people a day across the street getting their pics taken. Now we're off to yet another place we've never heard of - Homolovi State Park. Whenever we get to a new area we make a point of finding natural and historic points of interest. This little park sounds interesting, and is only 3 miles from Winslow. 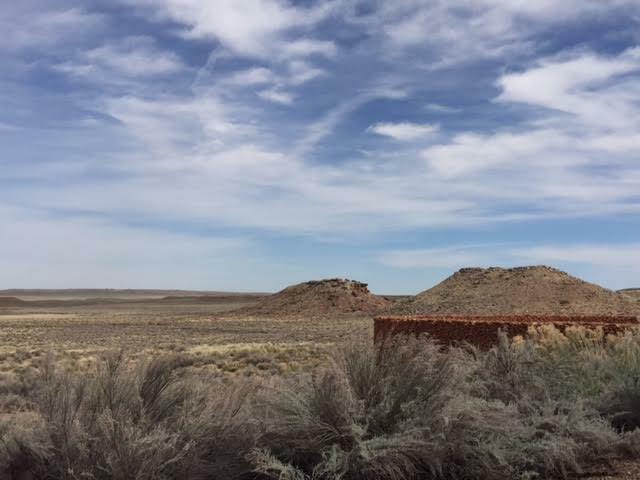 In the 14th century the Hisat'sinom (Hopi ancestors) built pueblos in the high grasslands along the Little Colorado River. 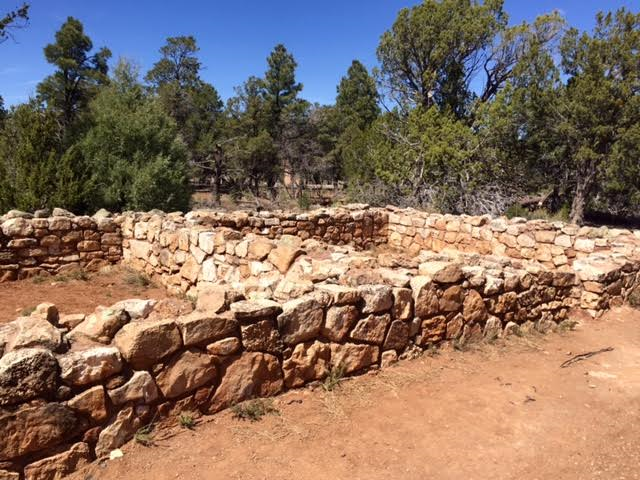 With the support of the Hopi people, the state park was established in 1986 in an effort to protect the sites that remained. The visitors center has the most incredible view. 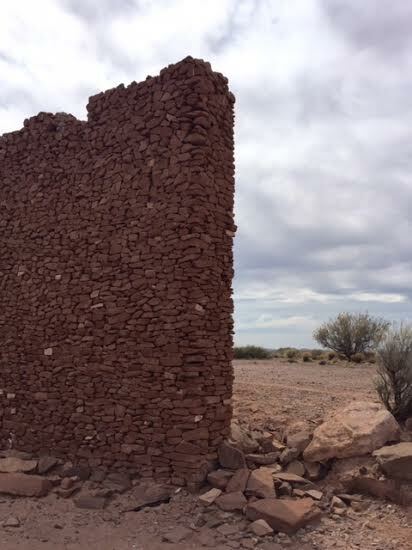 There are four areas of pueblo ruins, although two of them are currently closed. 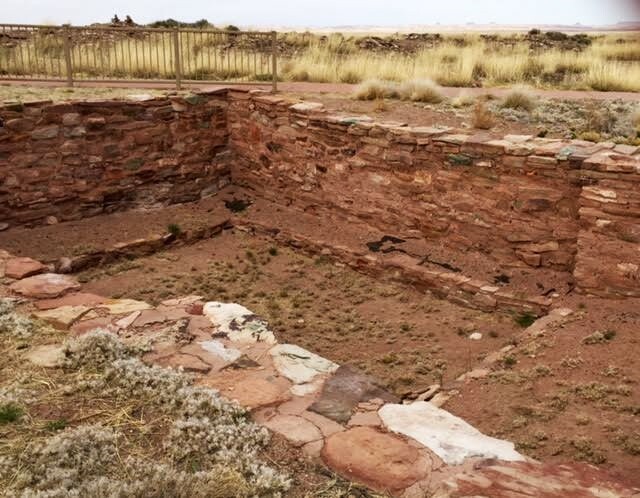 Homolovi I is near the small campground and has been re-buried by the park. After un-earthing the ruins along the river, they sustained substantial damage from the elements and it was determined that covering them again is best for preservation. We don't stop in that area, but the ranger explains that what you see of these ruins is the tops of the walls, rather than the foundations as you normally do. We spend our time here at Homolovi II. A very nice paved trail takes us into the ruins where we are encouraged to walk among the ruins, to pick up artifacts, to take photos, and then to leave everything where we found it. Fortunately it looks like the majority of visitors respect this. 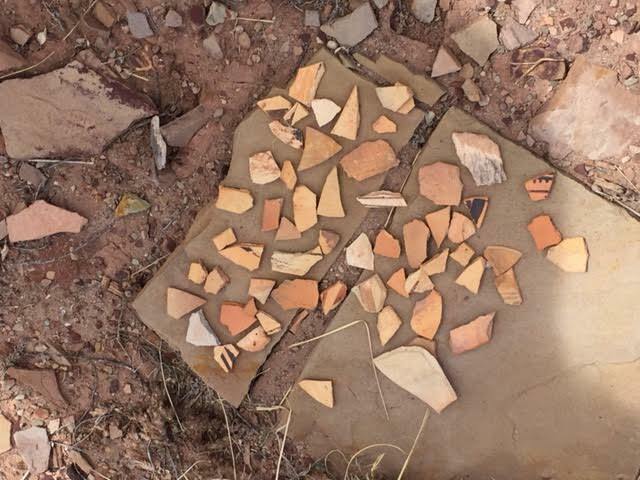 There are hundreds of pottery shards along the path, among the rocks and brush, and saved on flat stones for others to enjoy. 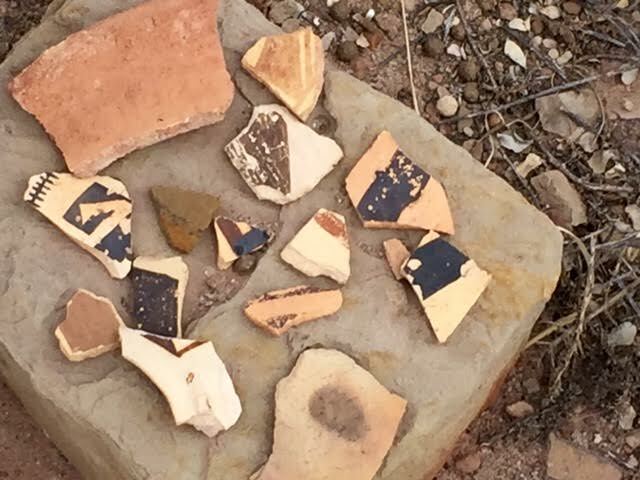 The Hopi tell us that the broken pottery and stones are now part of the land, and are the trail Bahana will follow when he returns. ......most of them quite small. The sad reality of history is still history. 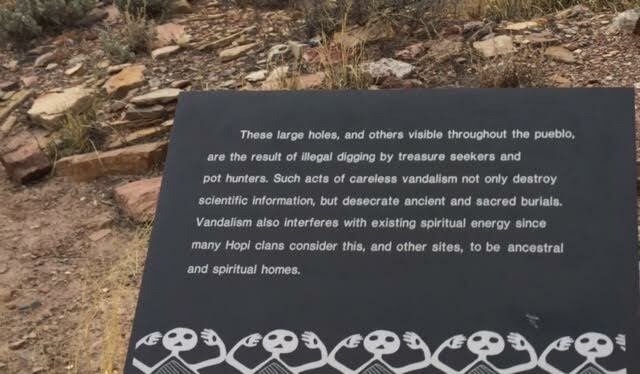 The holes were dug prior to the establishment of the park - and for me it means we've come a long way toward respecting sacred space. 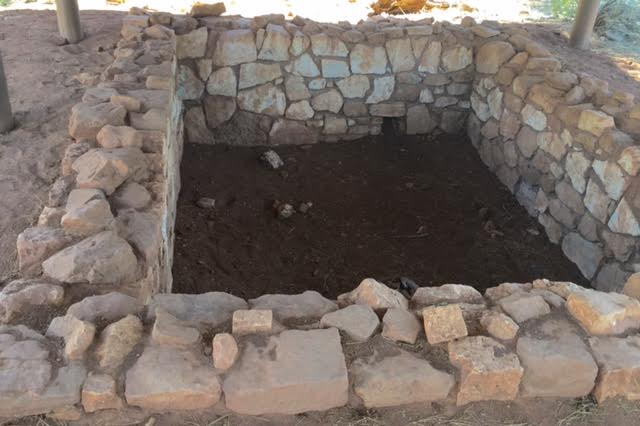 Beautifully preserved kiva with stone seating. The spirit of this place draws you in. The day before, the quiet added to the magic of what we were seeing. Today, the wind blowing through the tall grasses gives the place a feeling of authenticity. A few others pass through quickly, but mostly we are fortunate to have the place to ourselves. I could lose myself in the surrounding vistas. 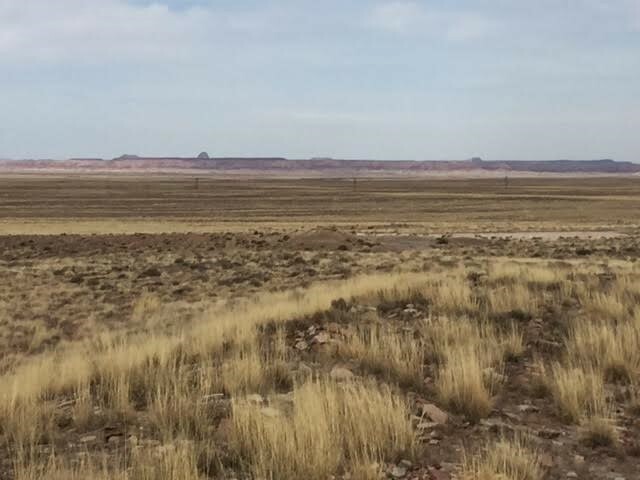 Tuutukwi, or Hopi Buttes are in the distance. 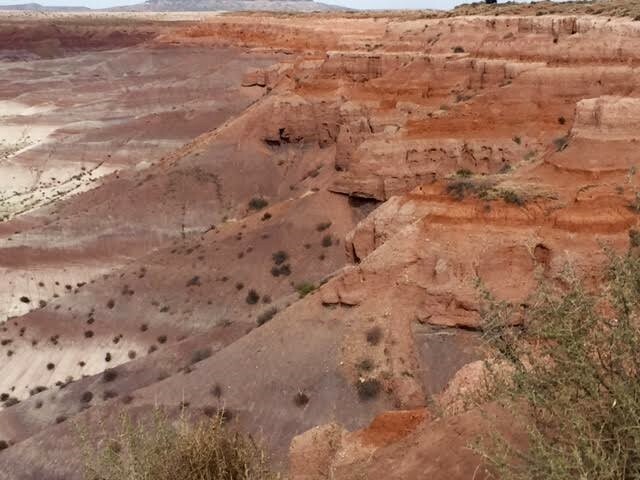 Some Hopi clans still use them as eagle gathering areas today. 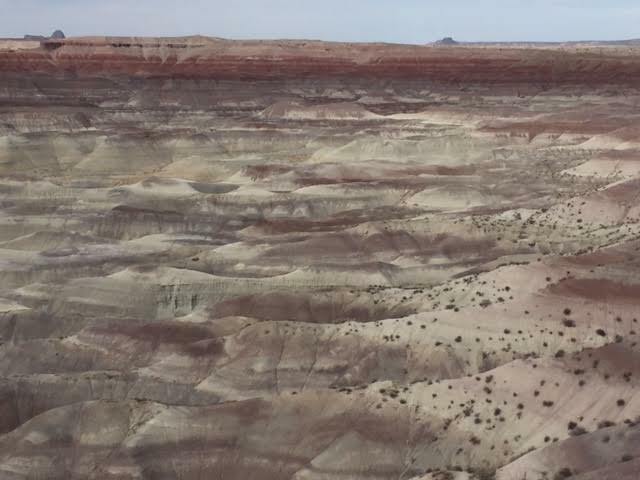 The Painted Desert is 300 miles from east to west. 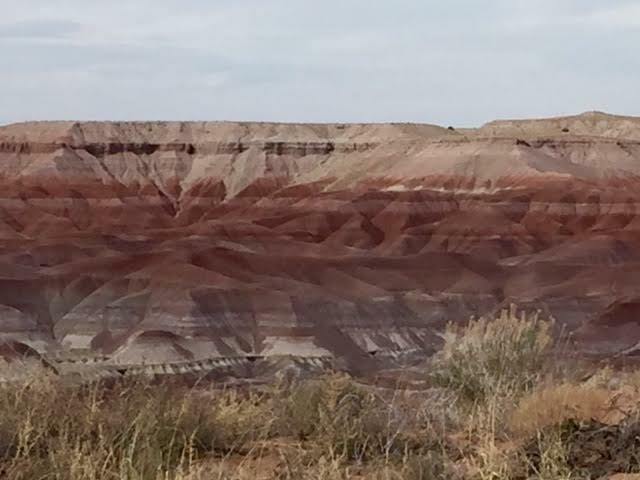 At the western boundary, Little Painted Desert is a county park. It is 13 miles north of Homolovi, and our next destination. Park is a stretch. 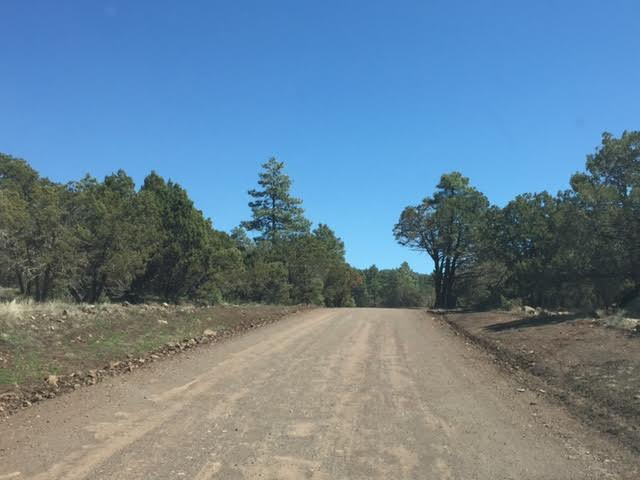 But there is a road of crumbling asphalt that takes us to the canyon rim. The light cloud cover blanches the colors, but it is still a spectacular sight. 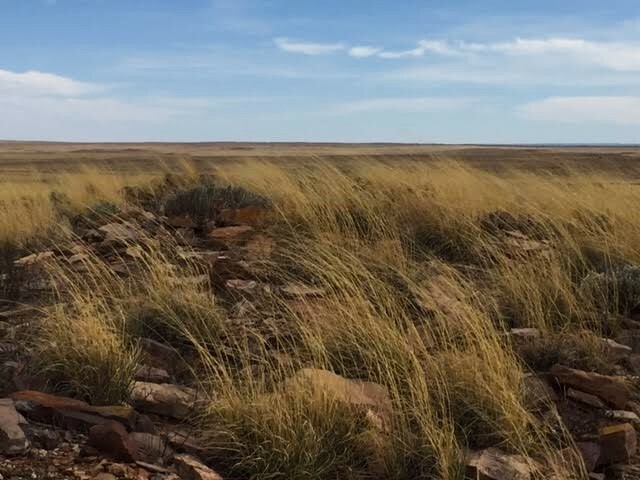 At the edge of the grasslands, we are once again in awe of Nature's majesty. What a fun day, enjoying an iconic music destination, discovering another historical sacred site, and viewing more natural beauty. Life is most definitely good! Never Heard of It - Let's Check It Out!